It’s summertime and while the temperature outside is going up, the temperature of drinks is going down, down, down…it’s iced coffee season! One of the best ways to get into the summer vibe is to make your own cold-brewed coffee at home. Cold brew has more caffeine and less acidity than hot-brewed coffee, so it’s gentler on your stomach. Plus, it’s super easy to make. In the video below, Todd explains how to make cold brew in a French press. If you need beans, the best for a strong, tasty cold brew are our classic Corsica and Nizza blends. 1) Use bottled water, or well-filtered tap water. The taste of the water you use will affect the taste of your coffee! 2) Pour room-temperature water over the coffee, using a spoon to make sure the water makes contact with all the grounds. Use 1 part coffee to 7 parts water, with quantities depending on the size of your French Press or cold brew receptacle. 3) Cover the French Press and let it sit out for 12 to 13 hours. Do not store the mixture in the refrigerator while it’s brewing. 4) After leaving the mixture out overnight or all day, press the plunger down on the French Press and pour the brewed coffee into a large jar or carafe. 5) Refrigerate and enjoy over ice! 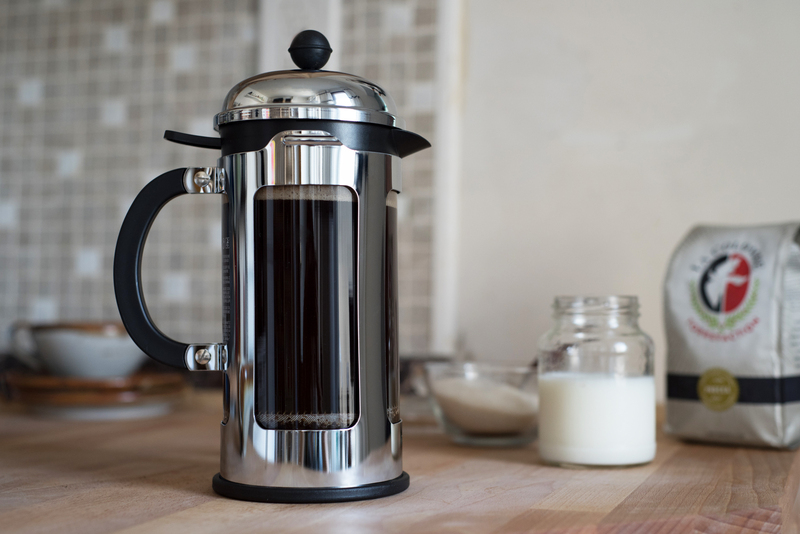 Want a beautiful, versatile French Press like the one Todd is using? Check it out here. Have questions about beans, brewing, or anything else? Shoot an email to social@lacolombe.net. dont forget to do a course grind for cold brewing. Equivalent grind for French Press or courser. How much coffee and water were used in this demonstration? The French Press holds 34 fluid ounces, but it’s really the ratio that you need to pay attention to! I’m confused on 1 to 7 parts of grinds (not liquid oz) to water (liquid oz). So, in this video, how many oz grinds to oz liquid? If I bought this exact French Press and did this exact process – what would the quantities be? About 800g of water to 115g of coffee! I’m confused too and would like the answer in oz, not g. Watching the video doesn’t “LOOK” like 1:7 ratio at all. One Oz. Coffee to 7 Ozs. Water. I have found that the water used to brew the LaColombe coffee makes a big difference in smoothness and taste. So far, the best has been the PH balanced and oxygenated water made by Alkame water co. It is usually found in natural or health food stores. Alkame Water makes all coffee taste good to me. No need to stir after adding the water or before pressing it? Why is the french press and coffee cold in the video even though you said not to store it in the refrigerator while its brewing? When I make cold brew I always put it in the fridge to brew. Otherwise I find that I get wild yeast off flavors (think Belgian beer). Cold keeps it clean. Yeah me too and 24 hrs lately has been ideal. Colder longer, idk it works. when using the large french press like is in the video, just fill the coffee to the top of the plastic band on the container, then fill the rest with water. And stir the heck out of it, stir it a few times every half hour or so until all the grinds sink below the water line. then just press the next morning or after about 12 hours. The ratio is not crazy important, remember this is going to be super heavy almost syrupy strong and most people will use plenty of milk to make a good cold iced coffee….. Thanks for sending this post. I really didn’t know about this 5 steps of killer cold brew. Now, I am getting information’s about this. It is really very good info for us. Keep posting. Thanks again. I like Reanimation’s Mosaic for cold brew!! What type of grind are you using for this? Fine or coarse? My assumption is coarse, like with a French press brewed coffee. This is not rocket science. For goodness sake. If you use 1 oz.of grounds then you use 7 oz. of water. The French Press holds 34 oz. 7 oz. of grounds is equivalent to 35 oz. of water. Close enough. Should you later dilute this with water or milk or is it just good enough over ice? You can dilute it or drink it straight over ice according to your own taste preferences! It’s pretty concentrated, so it’ll have more caffeine if you don’t dilute it. Are there certain coffees/roasts that you recommend over others? Depends on your taste preferences! A darker roast cold brewed will get those round, chocolatey notes, while cold brewing a lighter roast will bring out sweet, fruity, citrusy flavors without the acidity of a hot brew.